Early spring is prime time to be on the lookout for the invasive plant lesser celandine along your streambanks and in your wetlands. Lesser celandine is a low-growing green plant that flowers in March and April. Its heart-shaped leaves are dark green and shiny and grow on short stalks. The Latin name for this plant is Ranunculus ficaria. 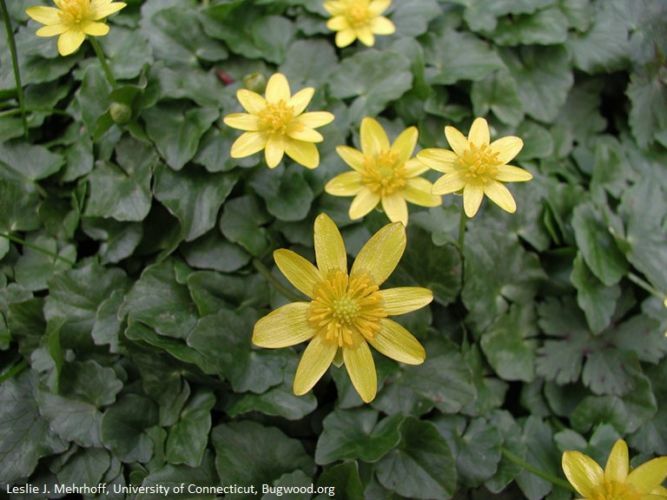 Be on the lookout for lesser celandine, a floodplain invader. Lesser celandine has bright butter-yellow, buttercup-like glossy flowers that are each about 1 inch in diameter. These flowers usually have 8 petals that emerge from a central disk. One plant can have several flowers but each flower grows on its own stalk. This invasive weed reproduces rapidly by seed and also through rounded “bulbils” that grow where leaf emerges from the stem. Although the above-ground part of the plant dies back by early summer, these bulbils remain and are moved around by rain and animals to start new populations. 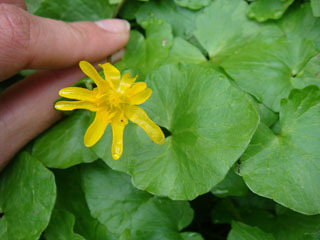 Lesser celandine also has below-ground tubers that are thick and finger-like. The tubers are storage organs that keep the plant alive through the rest of the year when the plant isn’t visible. One high-quality native plant that folks sometimes confuse for lesser celandine is marsh marigold (its Latin name is Caltha palustris). Don’t confuse this related native wetland plant, marsh marigold, for the invasive lesser celandine. 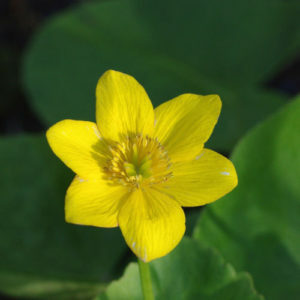 Marsh marigold also has larger shiny dark green, heart-shaped leaves and also blooms in the spring, but it grows in somewhat different habitat and has fewer petals. You’re most likely to find marsh marigold blooming singly or in small groups around a wetland or in a stream or lakeshore setting where there is water or saturated mud. You won’t find it higher up on the bank on drier soils. Its flower parts are also different: marsh marigold flowers have 5-9 yellow petals, whereas lesser celandine’s flowers have 8 or more petals. Marsh marigold also doesn’t have tubers or bulbils. Lesser celandine has only recently invaded Wisconsin, which makes its control all the more important now, before it spreads and gets out of control. If you find a plant that you think is lesser celandine, take photos of the plant and/or collect a sample, note the location of the plant, and send the photo and location to invasive.species@wi.gov, or call your local WDNR Aquatic Invasive Species coordinator or Kelly Kearns (608-267-5066). Find more information about this wetland invasive species (including how to control it) on the WDNR’s website. Photos by Leslie J. Mehrhoff (University of Connecticut, Bugwood.org), Brian Russart (Milwaukee County Parks), and Kate Redmond (UW Milwaukee Field Station).